TENS | Products > LCD TENS | Gemore Technology Co., Ltd. The GEMORE dual channel digital T.E.N.S. with Compliance meter that can store the treatment time used by the patients. Not only can set parameters accurately but also operate easily by six keys with LCD display by prescription for patients' condition. This device has a large liquid crystal display and press buttons, which is helpful for the people who can easily set the parameters. 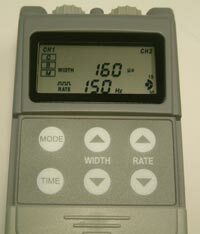 The LCD can show Width, Rate, Mode, CH1/2 and Timer at the same time. Pulse Amplitude: 0-80mA into 500 ohm load.